It may have been decided from the spot, but a win is a win and Chesterfield ensured they would take maximum points away in Martin Allen’s first competitive game in charge. With three points on the board after one game played – plus a clean sheet to boost defensive confidence – Spireites supporters couldn’t have wished for a better start to life in the National League; unless it was a 5-0 win. It was the first away victory that many had witnessed in person for quite some time, and a magnificent following of 850 travelling supporters was sent home happy for once, and in hope that it would be the first of many memorable away days this season. The showing wasn’t its best in the first 45 minutes, but the Blues came out of the block to fight back in the second half and take the victory when perhaps neither side deserved to lose. The two teams on Saturday were evenly matched; possibly a good sign for Chesterfield considering Ebbsfleet’s high league finish last season, showing that Martin Allen’s plans are heading in the right direction. More importantly, the Spireites were able to find a victory when both teams deserved to take something from the encounter. Looking at Manchester United during the Sir Alex Ferguson years, what helped to make them so successful was their ability to win games when not playing at their best; such a quality was demonstrated by Chesterfield on Saturday afternoon, although credit cannot be taken away from their second-half performance. It wasn’t the prettiest of showings from the Spireites, but perfection can’t be expected in the first competitive game for a brand-new squad. There were plenty more positives to take from the opening day besides the result itself; Zavon Hines proved what he can do with his quick feet, which ultimately earned the penalty which he tucked away himself to win the fixture. Marc-Antoine Fortune made an immediate impact after his introduction to the field as a substitute, and too helped to forge the winning goal with his link-up with Hines. With his step-down from 30 League One appearances last season, it was clear that he would have few problems in fitting in at fifth-tier level, even at 37 years of age. There were numerous other good individual performances, and whilst it wasn’t five stars for the team as a whole, there are clearly promising signs ahead of the season to come. With a win against one of the division’s toughest-looking sides, the Spireites have set themselves up well for encounters against other top outfits. In good time, too, as Aldershot Town – who also finished in the National League play-offs last season – are the first visitors to the Proact on Tuesday night. The worst scenario would have been Ebbsfleet outgunning the newcomers and the Spireites being left shell-shocked, but thankfully it was no baptism of fire. It is monumentally crucial to adapt to the division quickly, otherwise any chances of ending up at the right end of the table come April could quickly evaporate; if six or seven points are secured by Saturday evening, then this adaptation will appear to have been achieved. 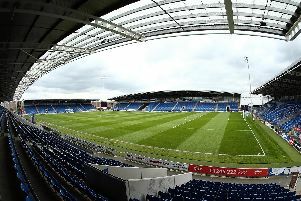 We are only at the campaign’s very beginning, and it won’t be until nine or ten games in when we can truly evaluate Chesterfield’s season and Martin Allen’s tenure so far. One thing is for sure, however, and that is that three points are on the board.